An incredible Gold Coast experience that you will never forget! 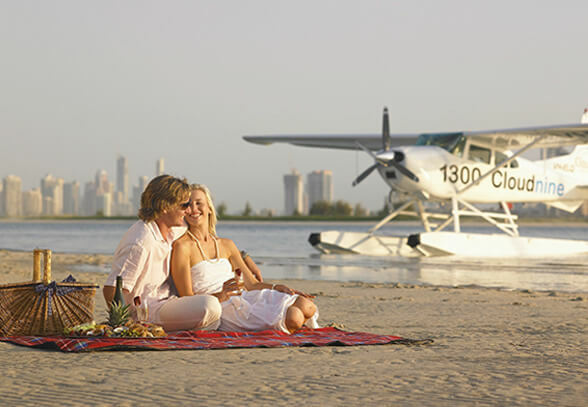 Cloud 9 Seaplanes offers Scenic Joy Flights, Island Day Tours, Romantic Island Picnics, Resort Transfers, Whale watching and Charter Flights on the Gold Coast and around South East Queensland, Australia.................... "Amazing views and an awesome experience". A scenic flight over the Gold Coast by Seaplane is just simply supurb. It has it all, scenery, fun, excitement, comfort and a feeling of safety and security that you don't expect. Departing from Seaworld Resort, you will experience some of the most incredible coastal scenery in Australia, combining the world famous beaches of Surfers Paradise, 360 islands of Moreton Bay and the natural beauty of the Pacific Ocean. The ultimate romantic getaway to your own island paradise. Enjoy a spectacular scenic flight over the Gold Coast before arriving at your destination where you can swim and explore or just relax and enjoy the peaceful surroundings. Departing Seaworld Resort in the morning, you will be pampered and experience some of the most stunning coastal scenery, islands and locations on the Gold Coast. A truly amazing package! Your flight departs Seaworld Resort in the morning and takes you all over the northern Gold Coast including the magnificent Sovereign Islands and it's multi million dollar mansions and boats. You will experience some of the most spectacular coastal scenery in Australia, combining the world famous beaches of Surfers Paradise, the islands of Moreton Bay and the natural beauty of the Pacific Ocean. 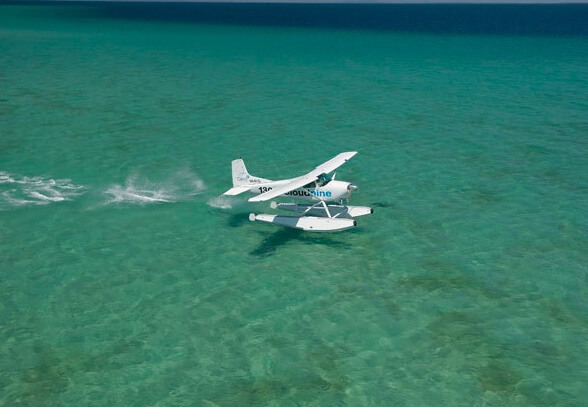 Cloud 9 Seaplanes allows you to custom charter the seaplane from 20 minutes to a day. We regularly fly clients for photographic and filming jobs, Real Estate viewing, wedding transfers, Island and resort transfers, boat/House boat pick-ups, birthdays and special occasions. We also do charter flights to/from; Moreton Bay Islands, Brisbane, Tweed Heads, Ballina and Frazer Island. 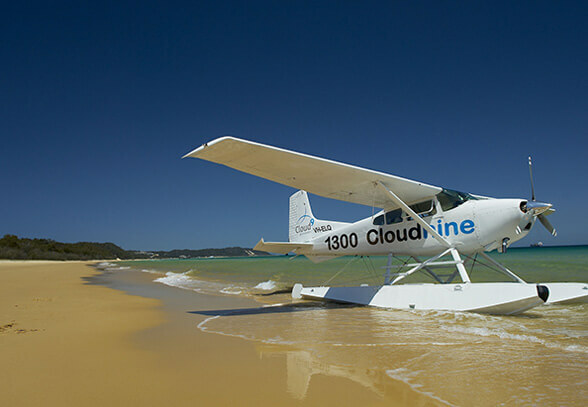 Flying in the Cloud 9 Seaplane over the Gold Coast was an awesome Experience! Takeoff and landing on the water on the Cloud 9 Seaplane flight was such an exhilarating experience, the view of the coastline was spectacular! 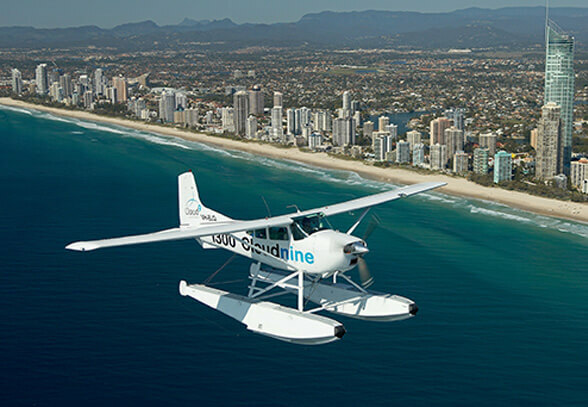 For anyone who is making the most of their time on the Gold Coast, going up in the Seaplane is certainly a way to see a whole lot of the coast in a short space of time. This was the highlight of my trip to Gold Coast. The ride in a seaplane was going to be exciting in itself, however, I got a lot more than I bargained for. With prices starting from just $65 choose what seaplane adventure best suits you then either book online or call or email us. We offer Gift Vouchers that are perfect for special occasions such as Christmas, Anniversaries or birthdays.